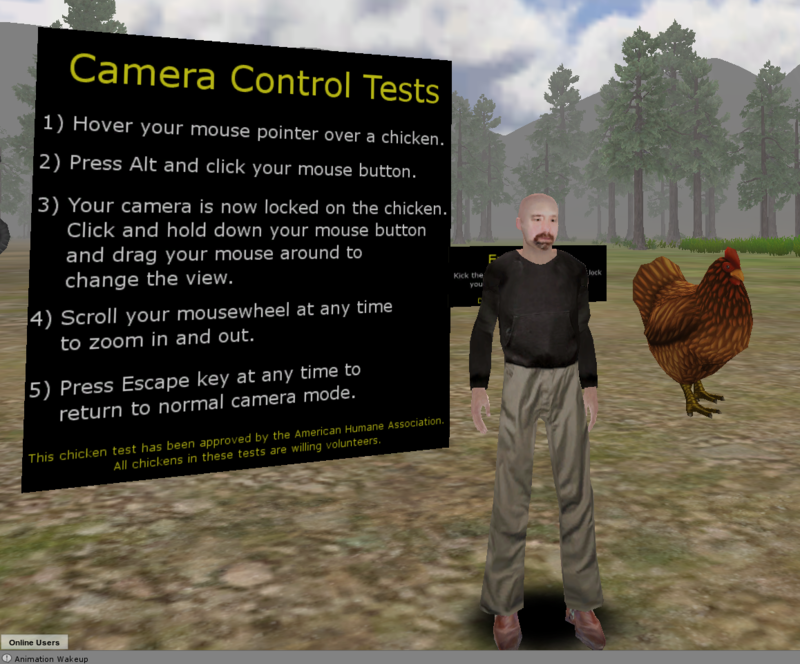 Jibe 1.1: Test our new camera controls at my chicken testing facility. Jibe 1.1 is now being rolled out! Here’s more info on what’s new. We’re very excited about the update. In addition to some other new features and lots of bugfixes, we’ve expanded how the camera works in Jibe. To try out our new camera controls, just visit my Jibe world and look for the big sign and big chickens set up near the default landing area. No chickens are being harmed in this test. I swear. The chickens are all making chickeny sounds, and you’ll be able to hear them more clearly as you zoom your camera in on them (your “ears” are attached to your camera). Please send us a ticket if you have any feedback or notice any bugs. And for more info about camera controls, be sure to read this page on our wiki. This entry was posted in Announcements, Avatars, Education, Jibe, Unity3D, Virtual Worlds and tagged avatars, education, Jibe, metaverse, online communities, ReactionGrid, Unity, Unity3d, virtual worlds by John "Pathfinder" Lester. Bookmark the permalink.